C.K is extending its work light range, with products, including rechargeable inspection lights, a lightweight head torch and an innovative clam shell 30W site lamp. All C.K lighting products combine high performance with quality features and the new additions are no exception, with advanced features and benefits designed to more than meet end user and customer needs. 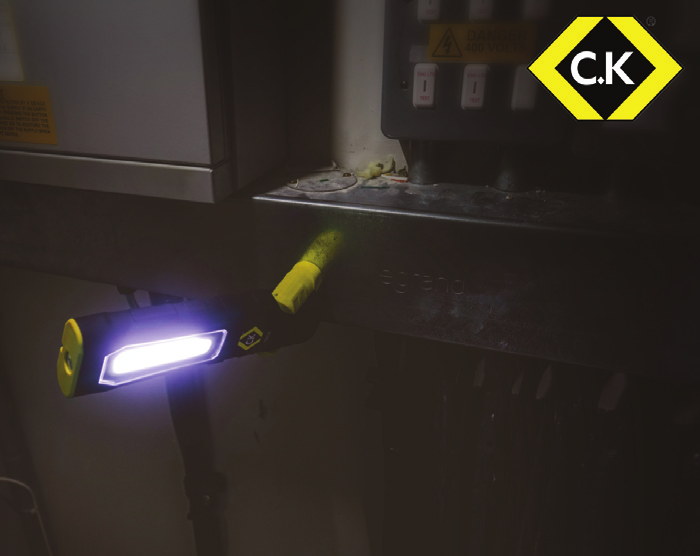 The COB-LED Pocket Inspection Light (T9620) (120 Lumens) is ideal for close-up working illumination, with the added convenience of an end of torch light. It has four lighting modes and a magnetic pocket clip. The high powered COB-LED Rechargeable Inspection Light (T9421R) (240 Lumens) offers a flood beam and pointed torch beam, plus a swivel magnetic base. Water and dirt resistant, it has a hanging hook and belt clip. Providing 12 hours of light from a single charge, the LED Head Torch (T9612) (150 Lumens) features three lighting modes; a high power and dimmed white light, as well as an anti-glare red LED mode for close proximity lighting. The COB-LED Rechargeable Flood Light (T9730R) (2700 Lumens) has two high powered COB-LEDs. The ingenious locking clam shell design ensures easy storage. Finally, the telescopic Tripod for 30W Flood Light (9730RT) is compatible with the T9730R Rechargeable Flood Light and has foldaway legs for easy storage.